Something happens to a woman when she finds a truly special piece. Lady gets a spring in her step and her fashion heart skips a beat…it makes her say yeah….Carti-yeah! 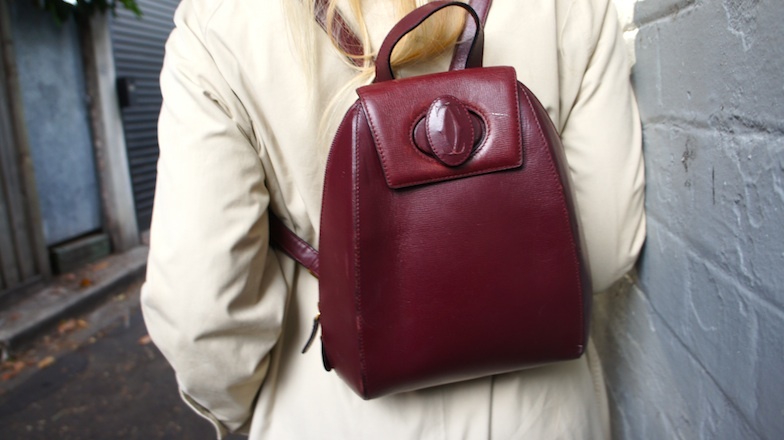 Beyond beautiful, this vintage Cartier back pack is sublime and seriously don’t get me started on the vintage Burberry trench. Both so timeless but for a fraction of the price. I found the Burberry trench at The Salvation Army [true story!] and the backpack is from Love Story. Even if you can afford the real thing, I love to hunt for treasures that fancy ladies may have forgotten. They seem to have much more character and mother nature gets a snuggle too. If you ask me the kick of finding preloved designer gems is even more gorgeous than walking into the store to buy it new.